The kabushiki gaisha (Japanese: 株式会社?, lit. “share company”) [kabu͍ɕi̥ki ɡaiɕa] or kabushiki kaisha, commonly abbreviated KK, is a type of company (会社 kaisha) defined under the Companies Act of Japan. Often translated as “stock company”, “joint-stock company”, or “stock corporation”. Chi Man Kwong adds: If I remember correctly, the Japanese Occupation Government only merged CMB and KMB and used a Japanese name (Jidosha Kabushki Kaisha). People like Tang Shiu-kin (who collaborated) still ran the company throughout the war. But I have to check if the Occupation Government or Tokyo had any plans to hand the company to a Japanese enterprise (they sometimes entrusted Japanese zaibatsu to take over HK enterprises – for example the Taikoo Docks). 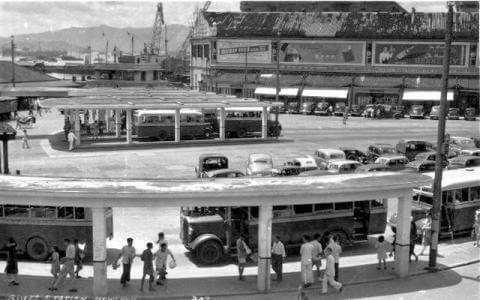 The image below is pre-Japanese occupation of Hong Kong. Any images of buses (or any form of transport), which are as rare as hen’s teeth during the occupation, would most welcome.